Respect for human rights remains at the heart of the search for peace and justice on the African continent. Of much relevance to this search is the concept of human security, which demands, amongst other things, the safeguarding of peoples’ vital freedoms. 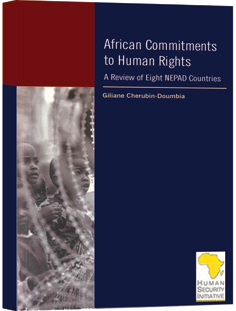 This “shadow review” of human rights observance in a selection of eight African countries is inspired by the aims and ambitions of the New Partnership for Africa’s Development (NEPAD). Algeria, Ethiopia, Ghana, Kenya, Nigeria, Senegal, South Africa and Uganda are considered in terms of their commitments to protecting personal safety and security, which encompasses the right to life, freedom from arbitrary arrest and detention, and freedom from torture, cruel, inhuman or degrading treatment, access to justice and freedom of expression. The study forms part of wider project of the African Human Security Initiative. ISBN 1-919913-51-3; 210mm x 150mm; 107pp.